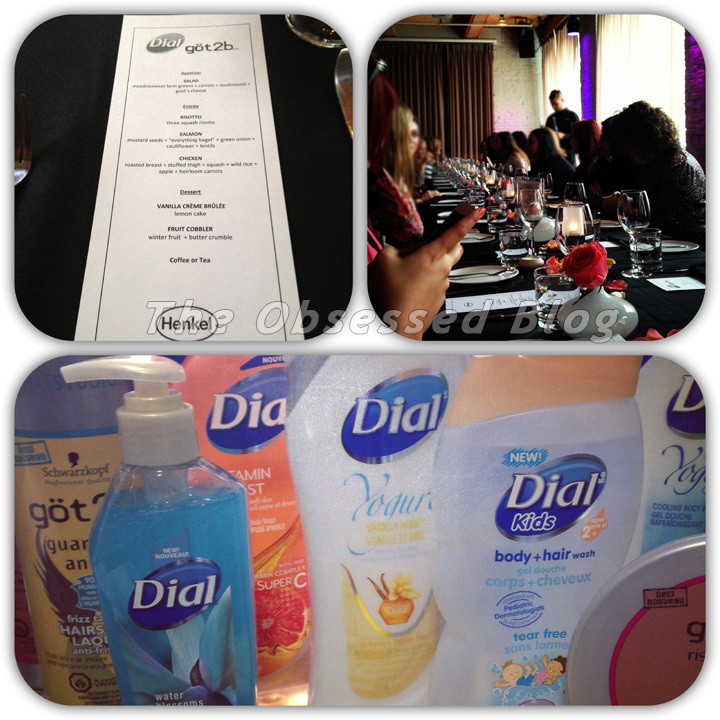 Recently a number of bloggers and editors were invited to Dial & göt2b’s 2014 Spring Launch in Toronto, where we not only had a chance to learn about the amazing new products hitting shelves, but enjoyed hand massages, hair styling… and oh yes, and a fabulous lunch! Some highlights from the launch include Dial’s new Fro-Yo body wash with cooling properties which is just amazing and so refreshing (!! ), new Vitamin Boost Body Wash with incredible scents, and a Lavender and Twilight Jasmine Body Wash, perfect for a calming, soothing effect… and from göt2b: four new revolutionary products in the göt2b Rise ‘n Shine line, a new Frizz Taming Hairspray from their Guardian Angel line, and the new Glued Spiking Wax! Some information on both brands’ new launches is below! Dial’s new Yogurt Body Care line is enriched with protein-packed yogurt. There’s even a Greek Yogurt 7 Day Moisturizing Lotion! Dial® Greek Yogurt Body Wash contains a clean-rinsing formula that provides ultimate moisturization. Developed with an advanced moisture-attracting formula, your skin will be its healthiest and softest yet, with the same Vanilla Honey scent you already know and love from Dial! Another option to keep your skin just as hydrated, and still containing the natural skin conditioning benefits of yogurt protein, Dial also introduces their brand new Frozen Yogurt Cooling Body Wash. Featuring a refreshing tingle that gently cools skin on contact, this innovative body wash is great for the warmer months, or just as a fresh kick-start to wake you up in the morning! Dial also introduces the NEW Dial® Vitamin Boost Body Wash, in two varieties: Amazing B is a lotion-infused creamy formula that draws in moisture to keep skin hydrated and nourished, with the divine fragrance of fresh tropical kiwi and mango. Super C is oil-infused and contains antioxidants that protect the skin, creating a radiant and healthy glow through the power of Vitamin C, and leaving behind the invigorating scent of orange and grapefruit. Finally, Dial’s Lavender & Twilight Jasmine Body Wash provides skin with all day freshness, and the light fragrance of lavender and jasmine to calm your mind and leave skin more healthy, smooth and beautiful than before. Dial’s new Body Washes retail for a suggested price of Cdn $4.99 (473 mL) each, and will be available at mass retail locations nationwide beginning March 2014. Dial also introduces new Deep Cleansing Moisturizing Hand Soaps in three great smelling scents: Yellow Raspberry – This fresh smelling aroma is perfect for in the kitchen where clean hands are a must! Water Blossoms – This clean and relaxing scent is the perfect addition to your bathroom when guests are visiting. Coconut Lime Verbena – Especially on a nice summer day, this cool scent is just what you need after you shake up those margaritas! NEW Dial® Deep Cleansing Moisturizing Hand Soaps retail for a suggested price of Cdn $2.99-3.99 (236mL) each, and are available at mass retail locations nationwide beginning March 2014. For more information about Dial’s wide range of products for everyone in the family, visit them on Facebook! göt2b Rise ‘n Shine Radiance Bounce Whipped Mousse provides root-to-tip shaping, and A-list finishing shine. Prep for heat styling with the göt2b Rise ‘n Shine Glistening Full Blow Dry Cream; an easy to disperse balm that leaves you with lasting lift and high heat protection for any hair type. For slick styles, hold and remold with the göt2b Rise ‘n Shine Gleaming Height Pomade. Water and oils provide excellent hold without a greasy or heavy look, and panthenol enhances the reflection of light for even more gloss! Equally suitable for adding texture, height or shine to short or long styles. Finish your show-stopping style with göt2b Rise ‘n Shine Luminous Lift Hairspray. Just a spritz will keep your strands starlet worthy all night long with enviable shine. Plus, available in göt2b’s studio-size can and guaranteed not to flake, you don’t have to worry about using more for a little extra oomph. göt2b’s new Glued Spiking Wax is the latest innovation to the brand’s iconic spiking glue. It provides men the liberty to craft, mold and remold their do into what they want, when they want – with very little effort required! göt2b Glued Spiking Wax is ideal for those who like the texture and consistency of glue or gel, but want a fashion-forward product to create controlled and touchable styles that coincide with what’s hot! Last but not least, göt2b proudly extends their Guardian Angel line with NEW Frizz Taming Hairspray! Proven to deliver 90% humidity defense and combat frizz, your style stays calm under pressure. Featuring special neutralizing agents that fend off the most humid of weather, göt2b Guardian Angel Frizz Protect Hairspray provides exceptionally high style retention over time in rain or shine. The search for heavenly hair ends here! Drug Mart, Walmart, Loblaws PharmaPlus and Jean Coutu across Canada. For more information about göt2b, contests and tips, visit them on Facebook!